Allosaurus is probably the most represented giant meat eating Dinosaur in popular culture after Tyrannosaurus Rex. At one point I’d say that it was the second most famous Dinosaur of all time, but in more recent years it has been replaced by other Dinosaurs such as Velociraptor and Triceratops. Still it does have a fairly large body of work behind it and in this article I am going to explore its role in popular culture. Allosaurus appeared in this novel as the main predatory Dinosaur. It appears in three sequences. First it murders several Iquanodon’s in the middle of the night and briefly attacks the main characters before Lord Roxton chases it away with a torch. It later chases Edward Malone when he is exploring on his own into a pit after which it abandons him. Malone theorizes that the great Saurians were practically brainless and that’s why it loses interest as soon as it can’t see him and heads off. Finally two Allosaurus’s attack the Natives village when they steal two of their eggs. They kill dozens of them, destroy their houses and buildings until the natives manage to kill them with a barrage of poison arrows. This sequence was always my favourite in the novel as it showed the reader just how vulnerable the humans were on the plateau. Two Allosaurus’s very nearly destroyed the entire village. Up until that point in the novel it appeared as though the humans were at the top of the food chain on the plateau the way they hunted the Iquanodon’s, the Icthyosaurs and wiped out their rivals the Ape men, but this scene shows you how mankind are in Malone’s words only there on tolerance. A pack of Allosaurus could exterminate all trace of them in about 10 minutes if they wanted too. The giant predator of the novel is never actually identified as an Allosaurus. Challenger only speculates that it is an Allosaurus, though Summerlise also says that it could be a Megalosaurus. The two men admit that it could be any one of the great meat eaters and so I suppose its up to the reader to decide which one it is. Still its often considered to be an Allosaurus most of the time so what the hell I’ll list it here anyway. The first ever film adaptation of Conan Doyle’s novel (which he himself appeared in) featured Allosaurus as the main predatory dinosaur. A Tyrannosaurus Rex appears too and is portrayed as the most powerful creature on the Plateau as it effortlessly kills a large Ceratopsian Dinosaur that mere minutes ago had gored an Allosaurus to death with its horns. Still Allosaurus has more screen time. Only one scene is taken from the novel where it attacks the camp fire. One humorous moment see’s Roxton toss the torch into the Allosaurus’s mouth which makes it look like its smoking a cigar. Probably the most famous moment in the film is when an Allosaurus pushes a Brontosaurus over the edge of a cliff. The special effects in this film were supplied by Willis O’Brien who would later go on to provide the effects for King Kong in 1933. Allosaurus was O’Brien’s favourite Dinosaur which is probably why he gave it a bigger role than Tyrannosaurus. Tyrannosaurus had only been discovered about 25 years before this film was released and as it was thought to be the largest meat eating dinosaur of all time it had completely overshadowed Allosaurus. So it was only natural that Tyrannosaurus would appear in the film. Still O’Brien’s loyalty to Allosaurus meant that he still got the bigger part. This 50’s movie about Cowboy’s fighting Dinosaurs was made by Willis O’Brien. It originally began as a project called the Valley of the Gwangi, that would have seen an Allosaurus discovered in a valley alongside other prehistoric beasts be brought back to a Circus where it escapes and murders several lions, before being killed by being knocked over the edge of a cliff. The project finally materialized as Beast From Hollow Mountain and bore very little resemblance to O’Brien’s original script other than them both revolving around Dinosaurs fighting cowboys. No explanation is given as to how the Allosaurus is alive in modern day. It just shows up and starts eating people and cattle. The film is still brilliant nonetheless. Its often regarded as one of O’Brien’s weaker films, but I don’t know why. Its an interesting and original idea of merging the Western and giant monster movie genre’s. The beast itself is also an impressive monster. I like the way its fast. Normally the big Dinosaur villains in movies are obviously slow so its quite frightening and surprising when the Beast darts after the main characters. This is also actually more accurate too as Allosaurus could run at 35 miles per hour which is faster than any land animal alive today except for Ostriches, Horses and Cheetah’s. Thus it would easily be able to outrun a human being despite its massive size. Its death sequence is also spectacular as we see the monster struggle and writhe as it sinks into the swamp. Like all truly classic monster movie deaths such as Kong and Godzilla’s deaths its quite moving in a way as the beast looks so helpless when it sinks. 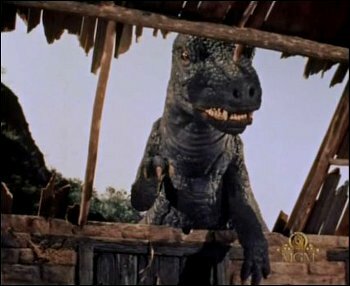 Allosaurus appears in this film that was basically the 1950’s version of Walking with Dinosaurs. It attempted to tell the story of all life on earth and though it did try to be as accurate as possible, by today’s standards it is dated. It features many theories that are now often used as a by word for showing how little we understood Dinosaurs in the past such as the idea of Sauropods living in the water or Dinosaurs not caring for their young. Still I find that its quite an interesting little time capsule much like the statues in Crystal palace of Iguanodon that help us to see how much our understanding of Dinosaurs has changed throughout the years. The dinosaur sequences themselves are also very well animated and too. In all fairness there are aspects of Walking with Dinosaurs itself that are dated by today’s standards such as the idea of non feathered Raptors. The Allosaurus is described in this movie as the precursor to the Tyrannosaurus Rex (though the two were not actually related, T-Rex in fact is much more closely related to modern day birds than it is to Allosaurus) and archenemy of the Brontosaurus. Brontosaurus doesn’t actually exist as what they thought was a Brontosaurus was in fact another specimen of Apatosaurus so this is another example of how the film is dated. By the time this film was made it was already known that Brontosaurus did not exist. Its name had simply become much more well known. To be fair it is a much, much better name. Allosaurus only actually appears fleetingly where it menaces a Brontosaurus. The meat eater with the most screen time in the film is in fact Ceratosaurus. The effects for this movie were supplied by Willis O’Briend and Ray Harryhausen, Obrien’s protege and friend. Allosaurus appeared in this 60’s remake of One Million BC. This is a classic example of the remake being better than the original in pretty much every way. The sets, direction, the music, the acting and above all else the special effects supplied by Ray Harryhausen. Allosaurus appears in a sequence where it attacks a tribe of cavemen. There are a lot of really creative and thrilling moments in this scene such as when the Allosaurus fishes the cave men who are swimming in the lake out, or when it corners a young girl trapped in a tree which is somewhat reminiscent of the scene in King Kong when the Brontosaurus corners a sailor up a tree. Its probably a little homage as Kong was the film that directly inspired Harryhausen more than any other and there are little bits and pieces of it scattered throughout all of his work. By far and away the most spectacular moment of the fight is when the main hero Tumak kills the monster by impaling it and actually lifts it off the ground before ramming a spear into its throat! The Allosaurus sequence is one of the three most famous scenes from the film. The other two are when the Pteranodon captures Raquel Welch and carries her above its young, and the fight sequence between the Ceratosaurus and the Triceratops. Often whenever you see Dinosaur documentaries mentioning how man and dinosaurs (except for Birds) didn’t live side by side you will see an image of Tumak fighting the Allosaurus with a spear. I must admit whenever I picture cavemen and Dinosaurs living together this is also the image that pops into my head first. This Dinosaur western originally began as an idea by Willis O’Brien and was finally made into a movie in the late 60’s by Ray Harryhausen. O’Brien did make a Dinosaur western in the 50’s The Beast From Hollow Mountain, but Harryhausen’s Gwangi actually followed the plot of O’Brien’s original idea more closely. 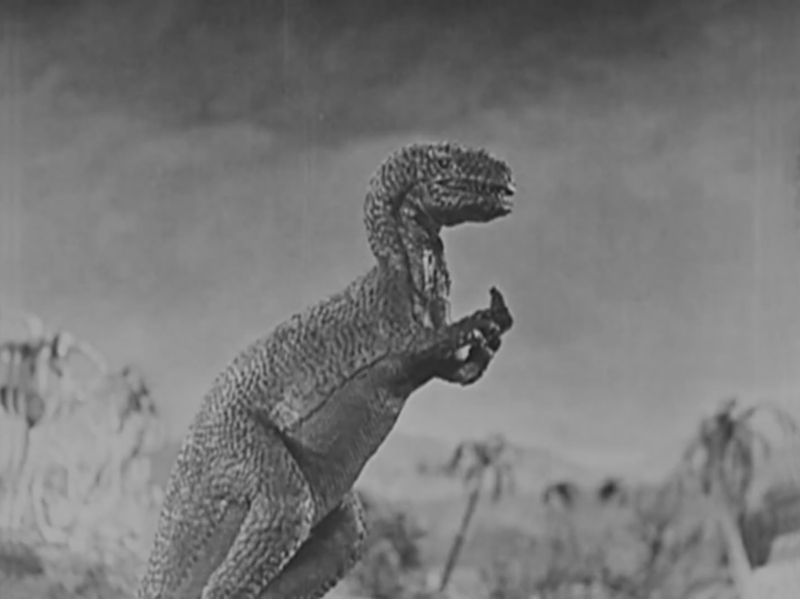 The main meat eating Dinosaur in the film Gwangi is often identified as an Allosaurus and O’Brien had intended him to be, but in truth he is actually a hybrid of Allosaurus and Tyrannosaurus Rex. Harryhausen said that he wanted to incorporate elements from both meat eaters. Though Allosaurus may look like just a smaller Tyrannosaurus the two predators were actually very different. Allosaurus was faster than Tyrannosaurus. Tyrannosaurus meanwhile was far more powerful and intelligent. Thus Gwangi has the speed and agility of an Allosaurus and the big bite and intelligence of a Tyrannosaurus. 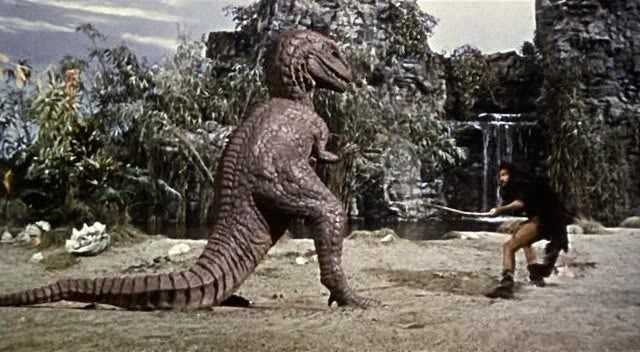 Harryhausen dubbed Gwangi a Tyrannosaurus Al, “Odd Lizard King”. A female Allosaurus named Alice appeared as a regular antagonist in this classic campy 70’s series about a group of explorers who fall through a portal into another universe where Dinosaurs still roam. She doesn’t pursue the main characters quite as often as Grumpy the large male Tyrannosaurus who is the main villain of the series. Big Alice is also worshipped by the reptile men the Sleevaks whose eggs she protects in exchange for sacrifices (which at one point includes the main characters of the series!) They refer to her as Seleema. Alice also appeared in the 2009 film remake of the series. Once again she is shown not to be afraid of Grumpy. She gets killed however in a surprisingly gruesome way when the main characters toss a can of nitrogeon down her throat which freezes her and then causes her to explode. The 70’s Grumpy and Alice. The 00’s Grumpy and Alice. 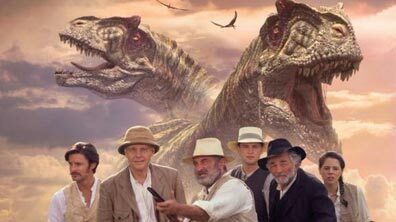 Allosaurus appeared in 3 episodes of this ground breaking BBC series. 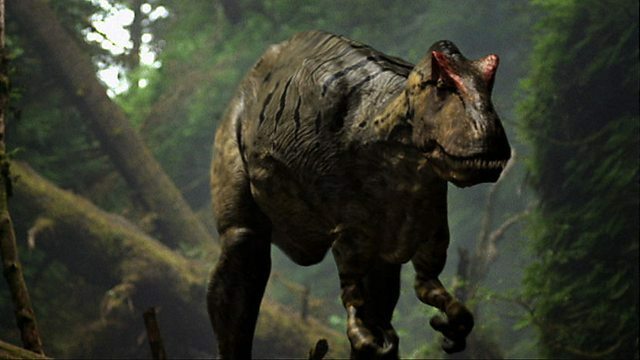 In Time of the Titans several Allosaurus attack the main protagonist, a female Diplodocus at various points in her life. The episode gives an insight into how Allosaurus may have hunted the giant Sauropods as we see the creatures use their superior speed and agility to leap through through the air onto their backs and hack at them with their hatchet like jaws. There is also a memorable sequence of an Allosaurus confronting a Stegosaurus that uses its plates to scare the beast off. This is undoubtedly one of the most famous images from the series. I always loved the design of the Allosaurus in this series. It looked fast, but powerful and the bright red crests on its head were very striking. I always preferred the Allosaurus in this series to the Tyrannosaurus. In the fifth episode of the series “The Spirits of the Ice Forest” which is set during the Cretaceous period features a smaller relative of the now extinct Allosaurus which is simply referred to as a polar Allosaur. This creature is not as big or as powerful as its Jurassic ancestor, though its still depicted as a dangerous carnivore in its own right and it actually manages to kill the main Dinosaur of the episode the female Leaellynasaura who it crushes in its jaws and then decapitates. A young male Allosaurus is the main character in the Christmas special The Ballad of Big Al. This story was based around the discovery of a real life near complete Allosaurus skeleton that was nicknamed Big Al and attempted to try and tell the story of its life. In many ways I think Walking with Dinosaurs helped to reintroduce Allosaurus to a whole generation of people. By the time this documentary came around Allosaurus had kind of fallen out of popular culture. Velociraptor and Triceratops had kind of taken its place. I think it was because people tended to see Allosaurus as just the second rate T-Rex. Its a shame as Allosaurus is every bit as fascinating an animal as any other Dinosaur in its own right and in terms of story telling I think its quite a good mix of Tyrannosaurus and Velociraptor. Its big and can eat you whole like T-Rex, but its also fast and nimble like the Raptors and also like the Raptors it is also often depicted as living in packs. Thus I think you can do a lot with it and I think this series which showed Allosaurus as a fast, strong, intelligent carnivore helped to break it away from just being the second rate T-Rex. I suppose this series was really its second big break. This 2001 BBC adaptation of Sir Arthur Conan Doyle’s classic novel starring Bob Hoskins restored Allosaurus to being the main villain of the story. Produced by the same team behind Walking with Dinosaurs this is the most faithful adaptation of the novel ever made. There are a few changes namely the inclusion of the character Agnes Cluny played by the lovely Elaine Cassidy in what was her breakthrough role and her insane father played by Peter Falk. These are more practical changes than anything else as naturally modern versions tend to include a female character to give it a bit of variety, whilst Falk’s character who strands them there is clearly designed to make Lord Roxton seem more sympathetic. In the novel its a man named Gomez whose brother Roxton betrayed on a previous expedition that strands them on the Plateau. Some versions have made this a much more important plot point and even turned Roxton into an outright villain, but this version makes him a dashing hero. At the end of the mini series in a further deviation from the book he stays in the Plateau and marries a native woman who he rescued from n Allosaurus. He also keeps an Allosaurus skull in their tent as a trophy! This is the first ever adaptation to include the Allosaurus’s attack on the camp. I don’t know why as it always had the potential to be a spectacular sequence. Tyrannosaurus Rex isn’t even mentioned in this film which is refreshing. As much as I like T-Rex (its my favourite Dinosaur) it is the main Dinosaur in just about every adaptation of The Lost World after Willis O’Brien’s original version. So its great to see Allosaurus back as the king of the Lost World once again. Allosaurus appears in this game based on the Jurassic Park franchise. Its a shame that it has never appeared in any of the films even in just a cameo but at least it has been represented in the games. The Allosaurus is a medium sized carnivore. It can’t take down the big predators, but it is still powerful enough to destroy vehicles and swallow visitors if it escapes in one bite. Its one of the most aggressive Dinosaurs in the park too. Allosaurus appears regularly throughout this game. I think this game which has always been my favourite Dinosaur game makes use of the Allosaurus better than many other forms of media. Here it is portrayed as a big and fast carnivore that travels in packs. It helps to stop it from just falling into either shooting endless crafty Raptors or running away from an unkillable T-Rex like in the first game. The Allosaurus can pick you up in its jaws and thrash you around, though it can’t swallow you.You will first encounter one as Regina when you are trying to rescue Dylan. It makes its entrance by knocking a car off a cliff. The best thing to do is shoot it at the side as its head is very heavily armoured.Also if you shoot at its head not only will you not kill it but it will piss it off until it goes bright red and feral. In this state it becomes twice as strong and fast. You will encounter it at various points including one scene where you have to travel through a nest of Allosaurus’s where you will have to signal your partner to blow them up. The Allosaurus also plays an important part in the plot when it kills Dylan’s best friend David. Poor David dies a heroes death as he sacrifices himself to save Dylan. Throughout the game Dylan blows the eye out of a Tyrannosaurus Rex and blasts dozens of Raptors yet its the Allosaurus that gets him in the end. I love the final crunch you hear as the Allosaurus tears him apart off screen. Even Regina whose seen more than her fair share of gruesome Dinosaur attacks can’t look at what happens to David. Another great post. I played Dino Crisis 2 a lot as well: when it came to tackling Allosaurus, I just dug out the flamethrower and burned away. I was a bit disappointed with the Allosaurus in JP:OG – it didn’t seem as well rendered as some of the other big carnivores. I was going to say that Brontosaurus is actually a valid species now, but apparently that’s being disputed by some palaeontologists! I’m actually bummed out that Allosaurus has been snubbed by the JP series. loved those Dino Crisis games!